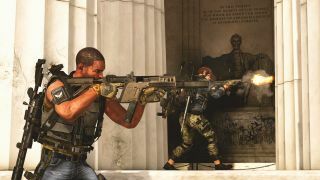 The Division 2 is opening up public test servers ahead of its next big update in an attempt to head off glitches and balance issues before they get to the general audience. Though the original Division experimented with running some console test servers, Ubisoft has decided to stick with PC-only testing for now. It's a good time for Ubisoft to drop this news. The Division 2 has had a rough week in terms of bugs, glitches, and balance concerns: there are overpowered enemies that have a nasty habit of rushing down players with no regard for cover, glitches that temporarily took daily and weekly projects offline, and some weird loot balancing that makes farming low-level items on a new character the best way to boost your damage. "We've seen the conversation in our community with the balancing in the game and everything. And there's a lot of this conversation that we would prefer to have before the update comes out," live content manager Yannick Banchereau said in The Division 2's latest State of the Game update. "So there's a lot of those things that we would rather put on a PTS, and then we would have that feedback and we can act on it and fix it for the upcoming update." Sometime ahead of Title Update 3 later this month, the PTS client will appear as a separate, optional download on the Uplay launcher for all PC players (it won't be available on the Epic Games Store, but if you own it there you also have it on Uplay). Your progress from the live servers will automatically be copied over onto the PTS, but don't expect it to follow you back. And not everything in Title Update 3, or the updates that follow, will be available for testing. "No, the raid is not gonna be available on the PTS, we're not gonna spoil it on the PTS, so that one will remain secret," Banchereau added. "But what's very important to us is to test the overall stability and the overall quality of the update, and all the balancing and all the potential new items we're adding, these kinds of things. We want people to experiment with them and tell us if these are comfortable, if they're balanced in a proper way, or if they're already figuring out ways to make broken builds and things like that." Even if you're playing on console and can't participate in the PTS yourself, you can watch streams or read discussion about the potential changes - Banchereau confirmed that there aren't any non-disclosure agreements for PTS players.